Learn more about the blaugelb treshold TBS. Accessible, disability-adapted planning, construction and housing. In our new flyer we offer more about the blaugelb treshold system TBS. The German standard for the construction of accessible buildings (DIN 18040) requires doors to be essentially free of thresholds: "Fittings and thresholds at the foot of the door are not permitted"; however, it allows for one exception: "If these are essential for technical reasons, they must not be higher than 2 cm." 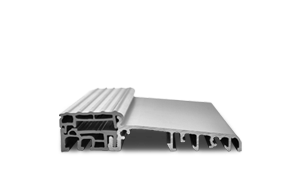 The accessible threshold solution for balcony and front doors in new builds and renovation projects specially designed for frame materials of PVC, timber (single and double rabbet), wood to metal and metal.